When looking to create a culture that is defined and informed by healthy review and encouragement it starts with asking for feedback. Leaders go first in demonstrating a posture of humility and a desire for continuous growth. What must we consider when it comes to giving feedback? Having an opinion is easy – communicating it in ways that are beneficial to the receiver is not. At least, not without some intentional consideration of language, purpose and context. It is completely unhelpful (and potentially destructive) to give feedback that is unprocessed. There is no such thing as ‘constructive criticism’! Criticism is the expressing of disapproval in response to someone’s faults or mistakes. It’s about de-construction not construction! Constructive critique? Yes! But not criticism. There’s no place for criticism in a healthy culture of feedback. Leaders tend to look more analytically at things – which is part of what enables them to lead change and increasingly better outcomes. Left unchecked, this can lead to being highly critical, negative and fault-finding. Encouragement is by far the greater tool for emboldening people for their best contributions and positioning them for maximum growth and development. People are often quite aware of their weaknesses, they trip over them every day. We need to recognise that most people are their own worst critics. The internal dialogue of many is a replay of all that has gone wrong, could go wrong and is going wrong. The last thing they need is to have those thoughts verbalised externally and in the voice of others. Personally, encouragement around what I can do and what is working has made the greatest contribution to my growth and improvement. I see this repeatedly in those I mentor, lead or train. Encouragement provides a core foundation for future development, a strong base from which to launch into addressing those areas of weakness or skill deficiency. When a person is confident in your confidence in them they are best positioned to tackle difficult stretch and growth. A “PRAISE SANDWICH” needs more bread. The old ‘praise sandwich’ – one piece of criticism sandwiched between two positive comments – is a good start, but research tells us that this ratio is inadequate. Most studies indicate that the ratio is more like 6:1 of positive words or experiences to counteract the negative for a person to reflect on an encounter, relationship or overall experience as ‘positive’. When giving feedback after failure or that requires a degree of rebuke, always assume the best. In trust-filled environments we must start with the belief that others intend for positive outcomes rather than assuming intentional failure or shortfall. Not only will it nett a more positive response, it’s a reflection of your own heart, attitude, focus and discipline to have gone to the best case scenario rather than assuming the worst. Assuming the best positions us alongside someone in their fight for greater personal character and outcomes rather than in opposition to them. Distrust is cancerous to healthy culture and relationships. Choose trust. Ensure that your feedback conversation lands in a way that the receiver can walk away with some practical next steps. What can they do differently? How can they address the shortfall? What might they think about for next time? Who could they enlist to help them toward a better outcome? Some situations are so specific and unique that they are unlikely to be repeated but there are always principles within them that can be adopted and transferred. Constructive feedback will help tease those out and highlight them so that a person feels they’ve added extra tools to their belt. STEWARD the moment with care. Remember, when your feedback is invited or required you are given incredible power. Another person is submitting themselves to your opinions and your words – this is incredibly sacred ground and is a position of high vulnerability for them. Regardless of the intensity of the situation, don’t forget you’re dealing with a person. In a healthy environment you might establish capacity for more robust levels of feedback and review but this is developed gradually and gently. In the rush of a moment or the busyness of personal or organisational life, we can be careless with our feedback. We can flippantly throw out observations that carry great personal impact to others. Or, we can neglect to take the time to speak encouragement. Often in meetings where time is short, we focus on what needs to be fixed as it seems most pressing – but sometimes, the greater investment might be to celebrate what ought to be affirmed so that it will be repeated. Read more in the FEEDBACK series – Let me give you some feedback, Asking for Feedback … stay tuned for Receiving Feedback. So you make new mistakes. We do some of our best growing and learning from failure. Although none of us would ever seek it, we recognise that it is one of our greatest teachers. That being said, someone else’s failure is far less painful for you and yet the benefit can be just as great. A mentor who is willing to expose their own mistakes and short falls and who has done the work of processing where things went wrong gives you the chance to get all the upsides of failure without the personal consequence. It is the height of foolishness to repeat the avoidable mistakes of others and yet it happens often because we don’t lean into the wisdom and experience of others who’ve been there and done that. So you don’t walk alone. Whether a leader in business or ministry, a parent, a student, a full time worker – we are all prone to feeling isolated in our roles. We can fall to the belief that we are the only one doing or experiencing what we are doing or experiencing and bare an unnecessary weight in that. When we reach out to mentors we ensure that we are not left to those feelings very long – if at all. The investment of encouragement and support from a relationship that is articulated and reliable gives us a sense of partnership that sustains and empowers us. So you give yourself every chance of success. A well chosen mentor is a source of great wisdom and insight. Because of their own experience, qualification or status in their specific field they are situated to give great advice and direction. You tap into a breadth of knowledge and awareness that is well beyond your own abilities thus building your capacity at a rate you couldn’t achieve alone. In a relationship of trust, correction and redirection can happen. Guidance can be given. Problems can be solved. Difficult conversations can be prepared for. Courage to do the hard things can be fortified. What would you add from your own experience? 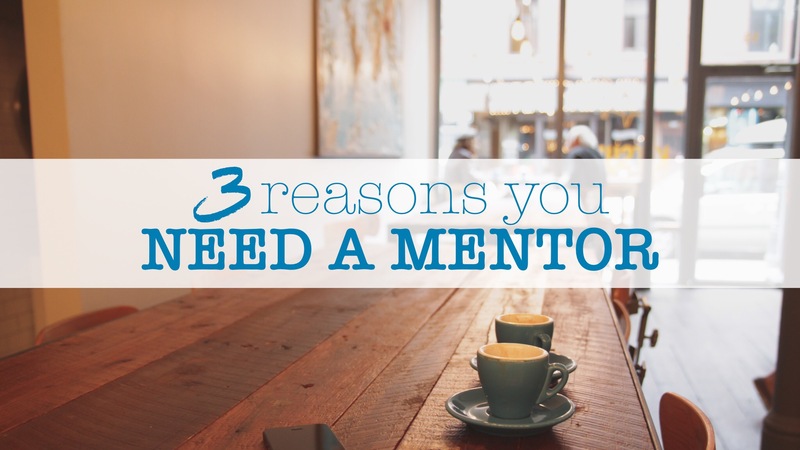 What are the benefits you’ve reaped from a mentoring relationship?